India is a vast country with the Himalayan Range forming its northern boundary. Its climate and geography are complex, so when considering your trip you need to plan carefully where to go, when to go and what your budget is. The initial experience of India - the heat, the noise and the street life, the vibrant colours and the multitudes of people - may bewilder and exhaust the first - time visitor, but the country and its people are friendly and hospitable. Once you have spent some time here everything will fall into place, and you will be amply rewarded with your first glimpse of the Himalayan peaks, one of the most spectacular mountain ranges in the world. 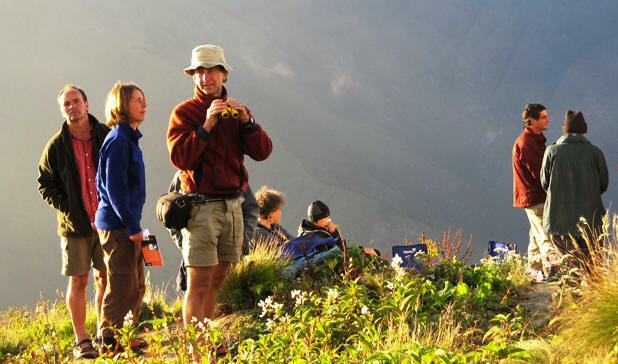 Kuaripass Nandadevi trek : The pass is probably the best window to view the high Himalayan peaks. 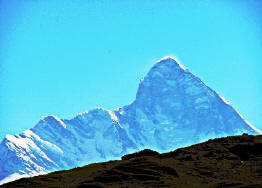 The views are simply breathtaking, facing north the vision sweeps from the gorges of Trishul. Day 1 : Delhi to Rishikesh (330m) 5-6hrs. Board the morning Shatabdi Express departing New Delhi at 7am. Reach Hardwar at 11:30 am. Transfer to the hotel in Rishikesh, a bustling pilgrim township, a popular meditation centre and the Yoga Capital of the world. After lunch, optional rafting on the Ganga till short of Rishikesh. Evening explore the township and attend the aarti (evening prayers) by the banks of the river Ganga. Overnight hotel. Day 2 : Drive Rishikesh to Ghat (1330m) 7-8 hrs. Day 3 : Ghat – Ramni / Ghunni (2550m) 6-7 hrs. The trail is steep up to the Kuari Pass (3690m) and it takes about 2-3 hours to get there. Once we are up on the pass, the views are simply breathtaking, a wide panorama of high Himalayas - the Chaukhamba range, Nilkanth (6596m), and Abigamin (7355m) extend to the Tibetan border. In the middle foreground, the main Himalayain chain in the vicinity of the Bhyundar valley & Hemkund includes Nilgiri parbat (6474m), Rataban (6166m). The last day of the trek is all the way down to the Tapovan. It’s about 3 hours drive from here to the comforts of the hotel in Pipalkoti. Purity of air, spirituality of mind..Devbhoomi is one of it's kind. Help wild life and nature....! !